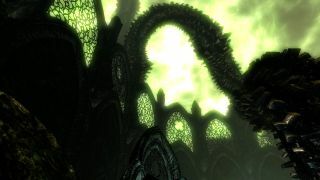 If, like me, you're the kind of person that likes to cross-reference every bit of minutia in promotional materials for upcoming installments of your favorite game franchises, this Skyrim: Dragonborn trailer analysis might be relevant to your interests. YouTuber samyoulonline drops some Tamrielic science, presenting some pretty believable theories about what locations, antagonists, and items might be involved in the next installment of Bethesda's Nordic fantasy epic. All signs seem to point to us facing off against the Daedric prince Hermaeus Mora, and traveling to his realm of oblivion. Also probable are the return of some classic Morrowind enemies like ash zombies and ascended sleepers. Personally, I'm still holding out hope that we'll be able to fly our dragons over the entire volcanic ruin of the Morrowind province. It's not like they have to populate a wasteland with quests and towns, right? Let us know about your theories for the Dragonborn DLC in the comments.